InfoSAWIT, JAKARTA - For the smallholders, it is a common thing to do when cultivating palm oil randomly. But it would decrease their income for the cultivation not based on Best Management Practices (BMP) would decrease the productivity and the potential of production would be out of reach. So it needs to learn and implement the good cultivation in palm oil. One thing to do is by reading the developmental book or BMP book. One book which is worth reading for the planters is written by Maruli Pardamean. 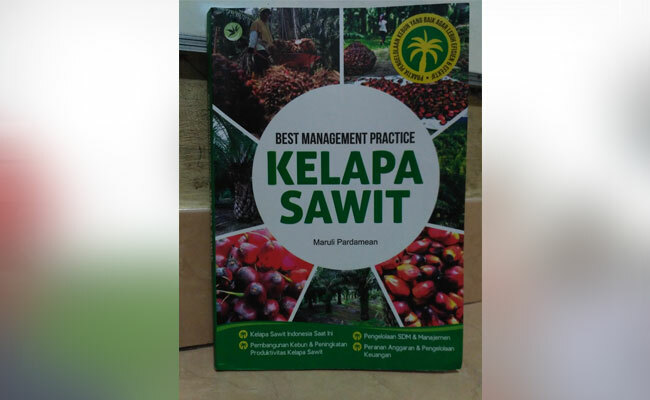 “Best Management Practice - Kelapa Sawit” is sixth book written by Maruli Pardamean that discusses about BMP in palm oil plantation. What is interesting in the book is that it is completed by the nowadays issues in palm oil plantation industries. For example, about the impact of palm oil moratorium which the government would implement, the potential loss, and the urgency to implement sustainable cultivation. The other interesting topic is the partnership scheme which is now being discussed by the smallholders. Many schemes could be the options but Innovation Financial Scheme might be implemented. Besides the two issues, the book also discusses BMP in detail, and the cultivation in peat for the planter having peat. The information in the book would be clearly useful for the readers. The contents of the book are the development from the articles published in InfoSAWIT magazine written by Maruli Pardamean and when reading the book, the readers would get the deeper information about palm oil cultivation. By implementing the suggestions to do BMP from the book, it is hoped, palm oil production would be better and getting double income. Hopefully.